I so enjoy mixing & pouring & grounding with an old fashioned pestle and mortar & stirring…I feel like a witch concocting a very potent, very healthy , good, magic potion….. The whole stirring process can be such a deeply fulfilling experience, a kind of meditation: As you stir the “potion” you can literally stir something up and together within yourself – stir with awareness and maybe thoughts or feelings might come together, bind, and suddenly seem clearer. And then the flow of stirring. 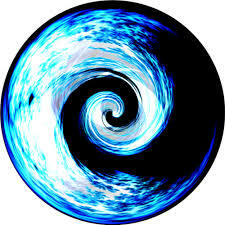 Here is the wonderful concept of Yin & Yang: if you want to change direction in a circle, do you just turn around? Stir the other way? Watch the pattern this creates in a soup for example. It will look somehow ” confused”. If however you follow a Yin & Yang shape everything comes together beautifully…, yum! And you’ve got infinity in your pot…since you’ll end up with an 8 – the symbol for infinity. And you will eat it….imagine that!!!! Yum Yum!! Maybe the steaming Cauldron is a symbolic gesture for the breath of life being unleashed when leaving the womb-shaped vessel, for bringing food up to high temperatures destroys so much of the goodness, the magic in them. RAWFOOD is either raw, completely untouched by heat or gently warmed up to 42 C to keep nutrients alive. 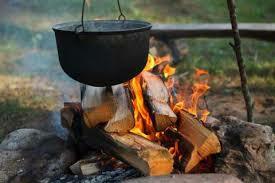 Maybe the old cauldron hanging well above the heat of a campfire will do just that: gently heating the freshly gathered deliciousness, not too fast, so the prayer has time to develop, the meal becomes a wholesome, nutritious blessing to all! Ever noticed that sizzling food in oil brings out the great smell of that food, yet exactly, it brings it out…together with minerals, vitamins and especially enzymes get lost during the heating process. Besides, raw carrots have so much more taste than cooked ones and that counts for most foods. Eating warm and warming foods in winter rather than hot food has thermogenic qualities as well. Digesting food that’s closer to our body temperature allows us to adapt to outer temperatures much easier as there isn’t the inner struggle to regulate from hot to warm or cold to warm…..like children who usually do not feel the weather like adults do, because their bodies are smaller and adapt faster and are also still “purer”, while older bodies are used to central heating and eating seasonally unsuitable foods over years. If you have read the previous pages on this site you will have found out by now that these days we really do need all the goodness that comes in foods, or we will end up depleted, practically starving ourselves, which doesn’t necessarily mean skinny figures…in fact the opposite is true due to empty and fatty foods. An other interesting fact is that RAWFOOD puts less strain on the immune system than cooked foods. The body reacts to cooked food with leucocytosis, more white blood cells, which the body develops to fight inflammation, infection. Generally, when you start learning about RAWFOOD ways you are embarking on a journey that will take you to a much healthier life. You will become aware of whole, unprocessed foods, of alkalinity, nutritional content, discover the hidden poisons out there like refined sugars and certain fats…but above all you will feel and look fresher…..guaranteed! !